In his encyclical Ecclesia de Eucharistia (2003), Pope Saint John Paul II drew the eyes of the Church to the Face of Christ in the sacrament of the Eucharist. He coined a new phrase, one not encountered before in his writings or in the teachings of his predecessors, “the Eucharistic Face of Christ.” Thus did Pope Saint John Paul II share with the Church his own experience of seeking, finding, and adoring the Face of Christ in the Eucharist. 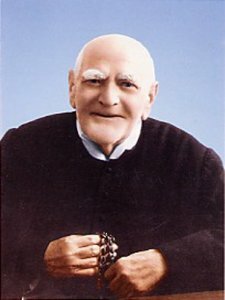 Gaetano Catanoso was born on 14 February 1879 in Chorio di San Lorenzo, Reggio Calabria, Italy. His parents, wealthy landowners, were exemplary Christians. Gaetano was ordained a priest in 1902, and from 1904 to 1921 he served in the rural parish of Pentidattilo. On 2 February 1921, Father Catanoso was transferred to the large parish of Santa Maria de la Candelaria. Everything was taken from the Common of One Martyr apart from the Collect and the General Intercessions. We commemorated the Blessed Virgin Mary of La Salette in the General Intercessions. we may rejoice to partake of eternal blessedness. There is something of a personal connection to San Gennaro. 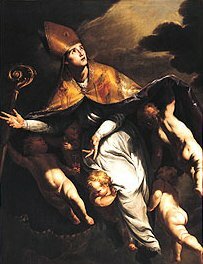 He was bishop of Benevento in Campania during Diocletian’s persecutions in the year 305. One of my maternal great–grandfathers, Giuseppe Martino came to the United States from Gioia–Sanitica in the Province of Benevento; his wife, my great–grandmother Rosina Biondi was from Faicchio in the same province. Giuseppe and Rosina Martino raised their family — my grandmother Adelina was the eldest — in a little white house on Daisy Street in the Highwood section of Hamden. They made their own wine, their own pasta, and their own sausage. They grew their own vegetables. To me, the cellar of that house was a magical place fragrant with dried basilico and other herbs. The wine was kept there too. The roots of our family’s Italian Catholic heritage are soaked in the blood of the martyrs. It grieves me that some of the descendents of Giuseppe and Rosina have forsaken the faith of generations. The joyful transmission of the faith is a sacred responsibility. My wonderful friend Terry N. over at Abbey-Roads did an excellent post on San Gennaro. Here, a little late in the day, is my homily on every Neapolitan’s favourite saint, and on Our Lady of La Salette as well. One of Barbara Pym’s characters often exclaims, “Too much richness!” I love the richness of the Martyrology and of the Church’s calendar. 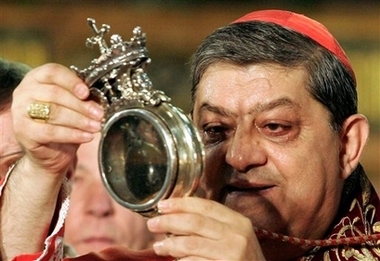 This very morning in the cathedral of Naples in Italy, Crescenzio Cardinal Sepe lifted up the reliquary containing the blood of Saint Januarius and, as it was presented to the faithful, the dried blood of the bishop of Benevento, martyred under Diocletian in 305, liquefied and bubbled up. Once again the faithful had their miracle, breathed a sigh of relief, and expressed their joy as only Neapolitans can.